A promising clinical study shows that the turkey tail mushroom () improves the immune systems of breast cancer patients. Immunity -- as measured by the number of lymphocyte cells and natural killer cell activity -- usually declines dramatically after radiotherapy. Natural killer (NK) cells protect us from tumors and viruses. Researchers at the University of Minnesota Medical School and Bastyr University Research Institute hypothesized that breast cancer patients' health can be improved after radiation treatment if NK cell counts increased quickly to attack remaining cancerous cells. 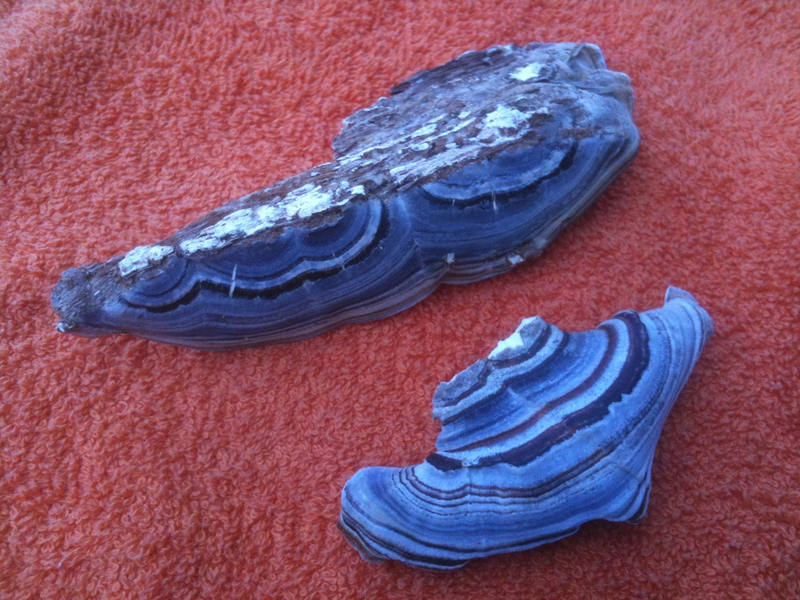 ... research by our center continues to indicate that Trametes versicolor represents a novel immune therapy with significant applications in cancer treatment ... The CD8+ T cell counts over the 9-week dose escalation study were enhanced in the 9 gm Tv dose cohort compared to both the 3 g or 6 g group. One-way ANOVA was used to analyze the overall difference between dosage groups over the treatment period (2-4-6 weeks). It showed the statistically significant increase in the CD8+ cytotoxic T cells for the 9 g group compared to both the 3 g and 6 g group (F(2, 6) = 42.04, P = 0.0003). Due to its long history of therapeutic use, however, turkey tail prepared and packaged as an immune therapy drug is unlikely to be patentable, deterring big pharmas from conducting costly clinical studies. Typically, the longer the historical use of natural medicines for treating an ailment, the less likely derivatized drugs from these natural products will be patentable. To fill this research gap, the NIH established The National Center for Complementary and Alternative Medicine (www.nccam.nih.gov), which funded and oversaw this study. NIH's interest is not surprising -- more than 70 percent of new drugs are estimated to originate from natural sources. This super-abundant colorful mushroom grows on dead trees, logs, branches, and stumps. Turkey tail mushrooms are called bracket fungi, meaning that they form thin, leather-like and leaf-like structures in concentric circles. Rather than gills underneath, as in shiitake mushrooms, their undersides have tiny pores, which emit spores, placing them in the polypore family. These mushrooms grow throughout the world, practically wherever trees can be found. In fact, turkey tails are some of most common mushrooms found on wood on the planet. Turkey tail mushrooms growing on a log in the old growth forest. They are commonly called "turkey tail" because their various colors: brown, orange, maroon, blue and green -- reminiscent of the plume of feathers in turkeys. In China, their common name is yun zhi. In Japan, this mushroom is known as kawaritake or "cloud mushrooms," invoking an image of swirling clouds overhead. In many Asian cultures, turkey tails' incurving cloud forms symbolize longevity and health, spiritual attunement and infinity. What are the medicinal properties and how is it used? Traditionally, our ancestors boiled mushrooms in water to make a soothing tea. Boiling served several purposes: killing contaminants, softening the flesh, and extracting the rich soluble polysaccharides. The mushrooms -- called fruiting bodies by mycologists -- are made of densely-compacted cobwebby cells called mycelium. With modern laboratory methods of cell tissue culture, the large-scale production of mycelium brought to light a whole new array of medicinal preparations. Nowadays, the commercial production of mycelium enables a cleaner and more digestible product than traditional mushroom preparations. Surprisingly, novel compounds are continually being discovered, which are not available using traditional preparations of the fruiting bodies, but are detectable within, and excreted from the rapidly growing mycelium. Turkey Tail, Trametes versicolor, is so named for its wide variety of colors. The natural killer cells promoted by ingesting turkey tails also target virally-infected cells. Moreover, turkey tail mycelium excretes strong antiviral compounds, specifically active against Human papillomavirus (HPV), which causes cervical cancer, and hepatitis C virus (HEP-C), which causes liver cancer. Viruses that induce cancer are called "oncoviruses." The virus-to-cancer connection is where medicinal mushrooms offer unique opportunities for medical research. The current thinking amongst many researchers is that turkey tails and other medicinal mushrooms lessen the odds of getting cancer by reducing causal co-factors such as oncoviruses. 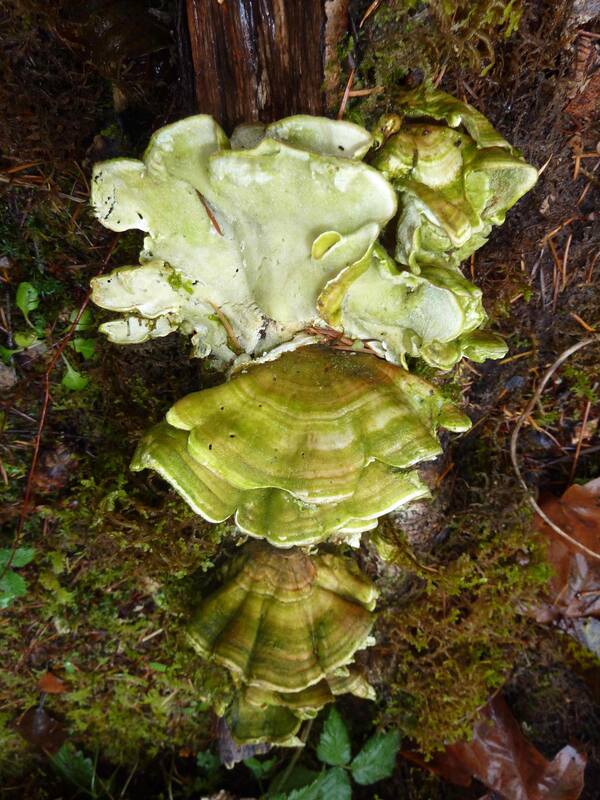 Turkey tail is renowned in Asia as a source for cancer therapy. The Japanese company Kureha first screened many polypore mushrooms and found that turkey tails produced a profound immune response, a discovery confirmed by many other subsequent studies. The Kureha researchers received a patent for extracting both the mycelium and mushrooms in 1976 and derivative U.S. patents through 1981 (long since expired). The extraction method led to marketing "PSK" (polysaccharide Krestin®) and later "PSP," both protein-bound polysaccharides. PSK became recognized as a cancer drug in Japan and approved under somewhat controversial conditions. Before approving a foreign-made drug, the United States Food and Drug Administration (FDA) has many requirements. One is that the Active Principal Ingredient (API) needs to be disclosed. Therein lies the problem. PSK is an assortment of sugars and attached proteins but has no unique molecule responsible for its impact on the immune system. Without that API, verification from batch-to-batch is not possible. Thus, it is classified as an undefined drug. This is one reason why PSK cannot be legally imported nor marketed in the United States. What products are available in the U.S.? While the fractionated "drug" version of turkey tail, known as PSK, is not legal to sell in the U.S., the pure turkey tail product used in the U.S. NIH breast cancer clinical study is widely available from Fungi Perfecti (www.fungi.com) under the label "Host Defense." 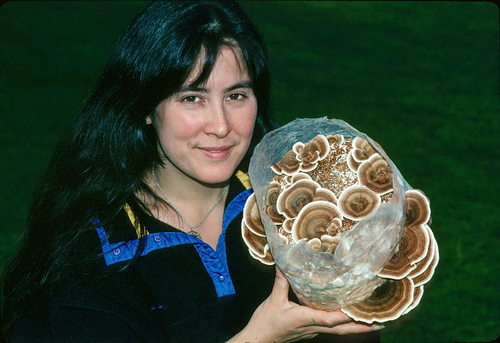 Since this turkey tail mycelium is presented in its unaltered form, it qualifies as a FDA approved "nutraceutical" ingredient. In this form, it can be advertised in the United States and Canada as a supplement to "support the immune system." Getting this nutraceutical on the shelves of health food stores lets physicians and patients access another tool to battle cancer. Enhancing the population and activity of NK cells and other lymphocytes and ensuring antioxidant effects against free radicals can both limit damage to healthy cells and reduce inflammation. These are some of the distinct advantages to using mushrooms in cancer therapy. Nature is a numbers game, and turkey tail helps tilt the balance in the complex battle to overcome cancer. Another factor to consider is that turkey tail mushrooms, like other varieties, can hyper-accumulate heavy metals, especially from air and soil pollution. Analyses of mushroom products from Asia, particularly Mainland China, have shown abnormally high levels of cadmium and other immuno-compromising metals -- not a good thing for people who want to bolster their immune defenses. This is one reason why it is important to find certified organic mushrooms and mushroom products. That said, another good characteristic of turkey tail and many other mushrooms like shiitake is that they can also accumulate selenium from the environment. When mercury meets selenium, they form a bimolecular unit that is totally non-toxic. This is why, whenever I eat fish, I like to have soup with organic shiitake -- or better yet, add turkey tails! Turkey Tail, as it ages, hosts algae and attracts insects. Wild turkey tail have a lifespan of a year or two at most, yet may persist years after they die, attracting and harboring successions of other organisms. Flat-footed flies, beetles and moths are super-attracted to the young turkey tail mushroom, so when you find these in the wild -- or grow them -- you often have an interesting community of co-existing organisms. Eventually the turkey tail, which has fine hairs on its upper sides, host algae communities, coloring the older mushrooms with tinges of green. (See above photo.) Because turkey tail is attractive to many other organisms, when you boil turkey tail mushrooms in water, you are probably extracting an assortment of other organisms in the process. In contrast, the mycelium can be grown under tightly-controlled clean room conditions, resulting in a more consistent, pure product. Dusty Yao holds turkey tail mushrooms being grown on sawdust. 1. Is the product U.S. certified organic? Make sure that there is a certifying agency on the label. Most consumers are not aware that seeing "organic" on the label, within a trademark, does not mean the mushrooms are organic. This is a common deception, and a subject of great controversy within the organic food and dietary supplement industry. 2. Is this product backed up with scientifically-valid studies? Many companies base their claims on studies, which have used mushrooms that come from other sources than the ones supplying them. Products can vary substantially, dependent on the culture, the growing techniques and the production method. Since independent studies are costly and time-consuming, the majority of mushroom products simply cite pre-existing research conducted on the same species, but do not test the specific mushroom products they are marketing. If possible, choose products supported by validated scientific research. 3. Where are the mushrooms grown and who grew them? Only skilled growers are aware of the many pitfalls in the process of cultivation. Make sure that not only a recognized expert supports the product but one with skills in cultivation. Most companies selling mushroom health supplements today buy on the spot-market, switching suppliers based on pricing and availability, from unknown sources. Companies typically hide their sources from consumers, saying this information is confidential. This gives companies leeway in switching suppliers, resulting in inconsistent quality. Consistency and purity are issues of concern. If you do not know where the mushroom products you are consuming are grown, think twice before eating them. Paul Stamets is a mycologist living in Kamilche Point, Wash. He is the author of six books on mushroom cultivation and identification, including "Growing Gourmet & Medicinal Mushrooms," "The Mushroom Cultivator" (co-author), and most recently "Mycelium Running: How Mushrooms Can Help Save the World." He has appeared at TED and TEDMED conferences, and runs a business whose website is www.fungi.com.